For anyone who has ever flown Laminar Research's amazing flight simulator X-Plane, it is an awesome and quite complex program that while being dirt cheap delivers a version of aviation reality that is about as good as it gets unless you buy time at FlightSafety or Simcom. There can be no mistaking the fact that X-plane is a big, robust program. It is so scalable, I am sure many users never get under the hood to find out just what it can do. They fly around in a 747 or Cessna 172SP, happy to just keep their landings between the runway lights. 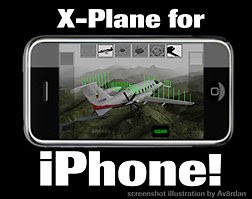 "X-Plane for iPhone is a fun little 'slice' of X-Plane that is just the right size to fit on the cool little platform that is the iPhone. We actually managed to get about 95% of the flight-model accuracy, many of the weather, sky conditions, and times of day, the default flight area, and 4 cool planes into this little sim, so you can fly around in the virtual skies when actually stuck back in seat 23-D, wishing you were flying instead!" "If you don't have an iPhone, you should seriously consider switching to one.. they are SOOOOOO fun! With Google maps, a really easy and powerful search function (just type in 'sushi restaurant' wherever you are and watch little red pins drop onto the map showing every sushi-joint around you) your current position plotted on the map, and all your iTunes music all on the single phone (with a stunningly high-quality headset), it is simply amazing how much power these little devices have, and how easy they are to use! Much like a GPS, I can hardly imagine traveling without one!" "The iPhone version of X-Plane is a fascinating glimpse into the future of mobile devices. Right now, we peer into a VIRTUAL world through our cell-phone, flying around in a make-believe airplane... but how long until the simulation is so realistic that the virtual world looks just like the real one? And is driven by your current location not a simulated one? At that point, the iPhone becomes like a pair of glasses that can see anything! Anyway, this is a first step down that road!" Hey, if anyone can harness the GPS power of the iPhone and marry it to a flight sim, it is Laminar Research's team. And if you wonder why Meyer and his team are so stoked on the iPhone, this page will explain their love of Macs. Now the real problem: I don't yet OWN an iPhone. In fact, I have yet to move into the world of "smart" phones...so does that make my funky little Samsung a "dumb" phone? My wife has an iPhone and loves it. And since my #1 reason to own a cell phone is to access aviation weather on Pilot MyCast – not yet available for iPhone – I must wait another 18 months or so for my current Verizon contract to expire. And trust me, the wait will be agonizing.